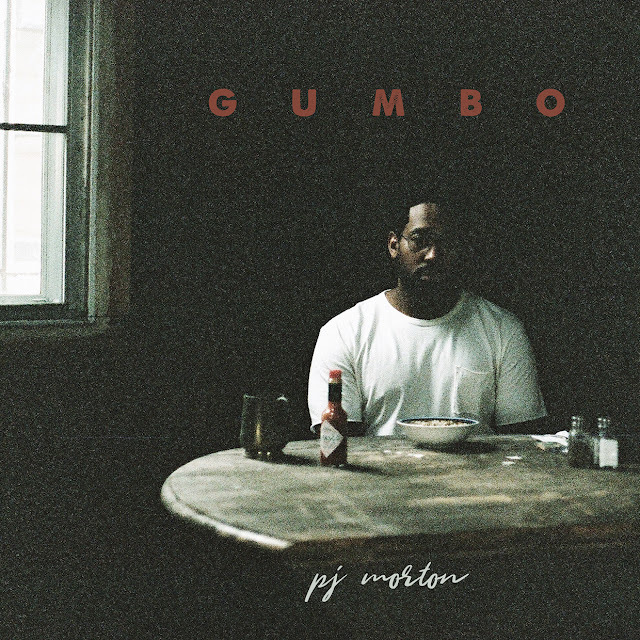 Who is PJ Morton? Nah...for real. I'm not trying to be witty or anything...seriously, who is this dude? I think I may have heard his name before but it doesn't really ring any bells 'round these parts. That is 'til I hear my dude JR singing his praises and I really do mean "sanging" his praises like JR was back in Brooklyn on the Fulton Street Episcopalian Baptist Church Choir. But if you know like I know, if JR "sangs" someone's praises, then you need to follow suit quick, fast and in a hurry before you're left out in the cold. So with that being said somehow, someway some dude I never heard of just knocked K Dot's "Damn" outta my rotation AND jumped over Joey Badass and Talib & Style's albums who both had next in my rotation, to move to the front of the line so this "Gumbo" better be worth it. "First Began" sets "Gumbo" off and is flat out beautiful beyond words. With PJ singing "if I die, I'd hope to find you in another life, so we can fall again, it'll be the way we were when we first began" there's no way this song won't have you wanting to fall in love all over again. And the string arrangements? Don't even get me started on them. "Claustrophobic" featuring Pell has PJ breaking down how he doesn't fit into one particular box even though his label would like him to, "PJ you're not mainstream enough, would you consider us changing some stuff/like everything about who you are, no offense we're just trying to make you a star/but I must admit I'm a claustrophobic guy, I have a hard time trying to fit into your small mind/and I have a habit of dreaming bigger then anything I can see right in front on me", "Sticking To Your Guns" is an uptempo funk number that sounds like it could've been on D's "BlackMessiah" and over a dope breakbeat "Religion" breaks down how some folk blame God for everything, "I don't think I like your religion, don't always makes the best decisions/not saying you don't have good intentions, I know that you are only human/but we blame your God, when it's your own fault, where is the love that your God spoke of/you God had nothing to do with them." "Alright" tells the story of struggle but has PJ letting you know you've been down this road before so everything's gonna be alright "oh my Lord I can't take no more, when it rains it pours, I know it feels like it's impossible/but we've been here before, you can check the score" and then goes directly into your future praise report anthem "Everything Is Gonna Be Alright" featuring BJ the Chicago Kid and the Hamiltones, "you know some people never change their minds (everything is gonna be alright) but either way we're gonna be just fine (everything is gonna be alright)/even when you try to bring me down (everything is gonna be alright), you see I'm still here, let me adjust my pride (everything is gonna be alright)." "Go Through Your Phone" has a ill guitar line that reminds me of the Wes Montgomery sample Diamond used for Pharoahe's "The Light" and has PJ breaking down why he's not gonna go through his shorty's phone and the album end with PJ freaking one of my fave song ever the Bee Gee's "How Deep Is Your Love." But my favorite banger on "Gumbo" is "They Gon' Wanna Come." Maaaaaaaaan this song is something kinda special and has PJ breaking down how if you weren't with him shooting in the gym, then don't come running after he gets the win. If we still had answering machines this would be my outgoing message from '93 til Infinity! Some folk say gumbo has the holy trinity of vegetables in it with celery, bell peppers and onions. And the very same thing could be said for PJ's "Gumbo" cause you've got my holy trinity of music dripping all throughout this album with nuthin but soul, gospel and funk on tap. To be honest, I can't remember the last time I heard an album where every single song stayed on repeat over and over AND over again. There's absolutely too much emotion, soul, love, funk and praise and worship for just one album. I'm telling ya'll after listening to "Gumbo" you'll feel like you fell in love, went on an amazing date, listened to some wonderful music, danced the night away and still made it to church on Sunday morning for one of those life changing sermons. And if that's not enough to make you check this album out, then you need to take Stevie's advice ASAP and have a nice 'lil talk with God cause something's wrong with your soul.